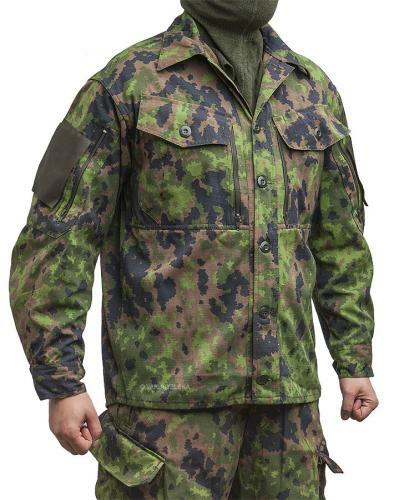 A modern, short hem field jacket with a cut fit for wear either outside or inside of trousers, works with body armor and such and you can even fit some warm stuff underneath. 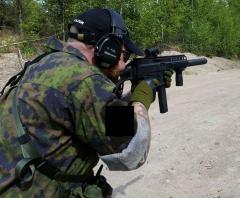 Comes usually in Jagel camo. Active cut - you can more around in this. Works both during warm and cold weather, just add stuff underneath. 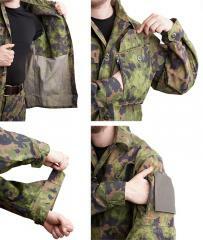 Button-up front: this is simple to repair in the field. Button adjustments on the sleeve cuffs. Sleeve pockets, chest pockets and zippered pockets behind these. Large velcro slabs on the sleeves for insignia. Sometimes included is a pair of epaulettes which you can sew on the shoulders, because Russia. 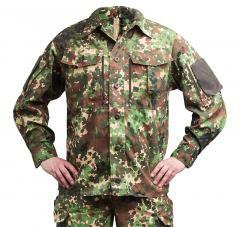 Made of tightly woven cotton ripstop fabric as used by Gorka uniforms of the same company (thicker than on the Anglija, for example). If you have to wash this, do it in 40 degrees Celsius - cotton and nylon don't mind, but the camo will gradually fade in repeated washings. First the traditional Russian size, then the same converted to centimetres - length and chest circumference. The cut is generous both length and widthwise, so don't sweat it when picking sizes. By picking your own size you will have much room for other stuff. Our model is size 175 / 95 cm and wears size 48-3 (170 / 96 cm).